Vianney Casas’s debut poetry chapbook Girasol ushers readers into a sensuous, menacing landscape where physical, emotional, and spiritual boundaries dissolve and reform in unexpected, profound ways. With minimal punctuation, shifts in tense, and deft weaving of English and Spanish, Girasol creates a dream-like quality, suspending the reader inside a trauma that’s simultaneously in the past and ever-present. Since its founding, Foglifter Journal has championed queer writers such as Eileen Myles, Paul Lisicky, and Donika Kelly, and has amplified queer voices from around the world. With Girasol, Foglifter Press steps forward as a new publisher of experimental and innovative queer chapbooks of poetry and prose. 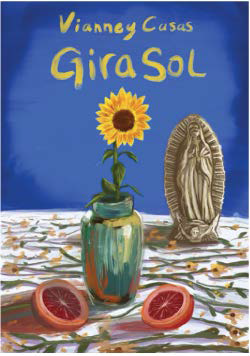 Girasol marks the debut of a gutsy, elemental poetic voice, one that both affirms and challenges familial bonds while struggling to maintain bodily integrity within the context of conservative Mexican society. Casas grapples with the question of artistic freedom within a colonialist tradition that exploits and obscures brown, femme bodies, and yet paradoxically draws solace from the suffering depicted therein. What does it mean to truly recognize the depths of silence society imposes on women? And what kind of world might emerge if this silence is broken? Girasol is both a flaming sword and blooming flower—a bright thing to bear ahead of us into that new, freer world.